Dystopian novel ‘After Tomorrow’ has been chosen as the 2015 winner of South Gloucestershire’s young people’s literature prize the Concorde Book Award. Author Gillian Cross was presented with the coveted award at a gala event at the Bristol & Bath Science Park in Emersons Green on Tuesday evening (10 March). Once again this year’s winner was chosen after an exciting district-wide reading challenge in which hundreds students from South Gloucestershire libraries and schools voted for their favourite from a shortlist of six fiction titles for young adults. The Hanham Library Bookwurms were also presented with the award for the best contribution to the Concorde Blog by author Ali Sparkes. 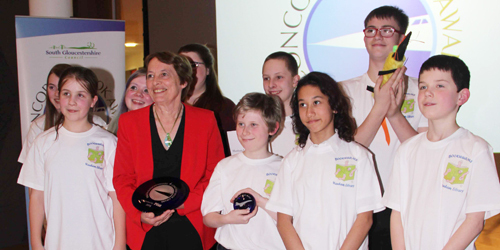 The Concorde Book Award is an annual award for young people aged 11-13, which aims to encourage them to read and raises the profile of children and young people’s reading. It is organised by the library service and secondary schools in South Gloucestershire and is supported by the Bristol Post. This year’s shortlisted titles were ‘Half My Facebook Friends are Ferrets’ by J A Buckle, ‘After Tomorrow’ by Gillian Cross, ‘Roof Toppers’ by Katherine Rundell, ‘Every Day’ by David Livithan, ‘Mutant City’ by Steve Feasey, and ‘Counting by 7s’ by Holly Goldberg Sloan. More information on the award can be found at www.southglos.gov.uk/concordebookaward and there is also a Concorde Book Award Blog http://concorde2013.edublogs.org where groups can join in and give their opinions on the books and find out what other young people taking part in the award think about the books.